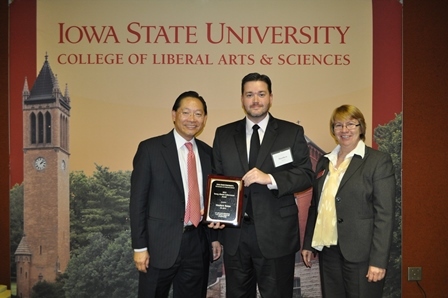 During the LAS fall homecoming awards ceremony on November 7, Matthew Renze (BS 2011) was awarded the Young Alumni Achievement Award by the CS department. Matthew is a regular visitor to Gloria Cain's careers class each year, has represented the department at high school career fairs, and served as a judge for the 2013 Computational Thinking Competition. In addition to his BS in Computer Science, he also has a BA in Philosophy and a minor in Economics from Iowa State. He is a regular speaker at a number of regional computing events, including the Iowa Code Camp, Nebraska Code Camp, and Agile Iowa. Matthew owns Renze Consulting in Des Moines, working on developing data-driven software applications using Agile methods, performing data analysis, and coaching/mentoring on Lean, Agile, Scrum and XP methods. Visit his website at http://www.matthewrenze.com/.